New England Patriots owner Robert Kraft is attending annual meetings hosted by the National Football League. According to the Washington Post, Kraft participated in annual NFL meetings at a Phoenix resort on Sunday. He was seen walking with his son, Patriots executive Jonathan Kraft, and speaking to NFL Commissioner Roger Goodell between closed-door meetings. Kraft was not available for comment. The Boston Herald said Kraft is expected to keep a "low profile" this week, forgoing his usual session with local media. Kraft issued his first statement on Saturday since being charged with soliciting prostitution last month. Kraft said in his statement that he had been wanting to apologize since charges were filed against him but had to remain silent "in deference to the judicial process." "I expect to be judged not by my words, but by my actions. And through those actions, I hope to regain your confidence and respect," his statement concluded. Kraft, 77, is one of hundreds charged in in the Palm Beach County prostitution sting. He has pleaded not guilty to two counts of solicitation. 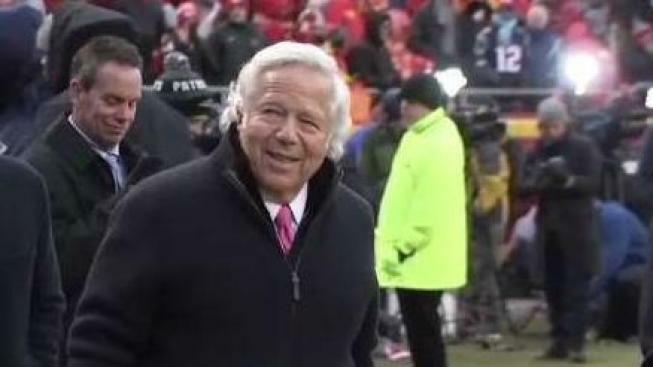 Prosecutors have reportedly offered to drop the charges if Kraft and the other suspects admit they would have been found guilty at trial, complete a course and 100 hours of community service. The deal also reportedly stipulates that the suspects be screened for sexually transmitted diseases. After the charges were announced on Feb. 22, a spokesperson said, "We categorically deny that Mr. Kraft engaged in any illegal activity."